Adult social care employers contribute £46.2bn to the UK economy, according to a Skills for Care & Development report. The study calculated the sector’s economic contribution by combining workers’ wages (£24.3bn), income generated through purchasing services (£10.8bn) and employees’ spending in other sectors (£11.1bn). The report also estimated the sector’s total workforce at 1.8m, including 1.2m full-time positions. Skills for Care & Development was established in 2002 as the UK Sector Skills Council for people working in early years, children and young people’s services, and those working in social work and social care for adults and children in the UK. Skills for Care & Development Chair, Dame Moira Gibb, said: “This is the first time we have produced a UK wide report into the economic value of adult social care and we find our sector injects billions into the national economy. The report was also welcomed by the former Chair of the UK Statistics Authority, Sir Andrew Dilnot, who also chaired the Commission on Funding of Care and Support. 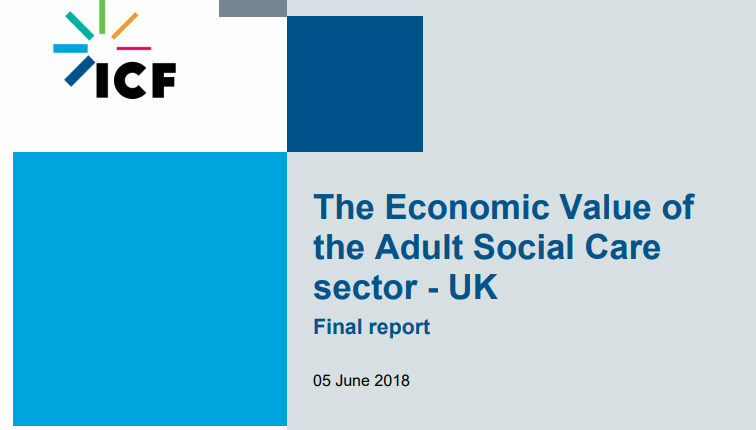 “The value of this report is that it provides evidence about what we have always believed anecdotally about the significant economic contribution that adult social care makes across the UK,” he said. Vic Rayner, executive director of the National Care Forum, added: “I hope that this report will provide a solid evidence base for both the green paper and the social care workforce strategy. These key policy documents are going to be instrumental in shaping the future of social care provision in England.